BlogWhat do your first year of law school and inter partes review have in common? I want you to think back to your life as a law school student. Don’t cringe. For some of you, it was a painful experience. For others, it was a time of intellectual challenge and growth. Do you remember asking other classmates for specifics about a professor – their teaching style, their final exams? Do you remember asking around for a class outline? Or did you make your own? Did you go to your professor’s office hours? I sent a flurry of emails to several people between four and five a.m. I asked for help. I asked many questions about the type of assignment I was working on. I asked many questions about my professor. Before the end of the day, I had a couple of meetings with people who gave me detailed guidance regarding my assignment and my professor. I got the information I needed to help me get through this assignment, to get through this class, and to get through the first year of law school. Now let’s come back to you. Now that you’re a practicing attorney, how often do you think back to your school days and remember what helped you get through your tough moments? Let’s say you are working on an inter partes review. 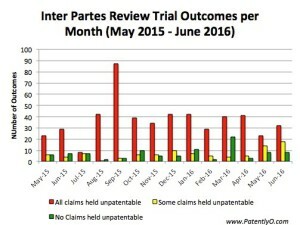 An inter partes review is a trial proceeding conducted at the Board to review the patentability of one or more claims of a patent only on a ground that could be raised under §§ 102 or 103, and only on the basis of prior art consisting of patents or printed publications. What type of research do you do when you are working on an inter partes review proceeding? Do you find out how long the process will take? Do you research your assigned examiner? Do you find out their percentage of approved and rejected IPRs by this examiner? Do you research whether scheduling an interview with your examiner will help or hinder your application? Or do you wing it? 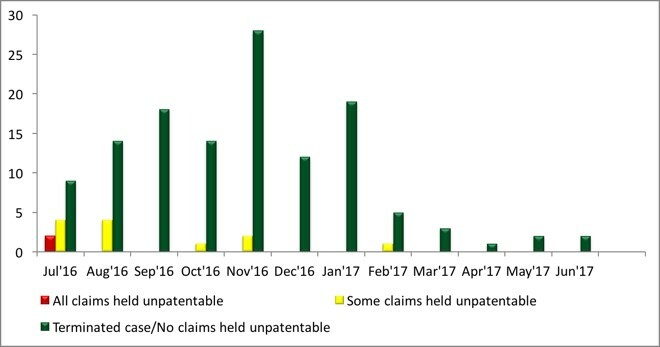 Looking at the statistics of inter partes reviews from May 2015 to June 2017, more claims were held unpatentable than not. 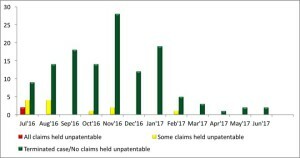 What if the attorneys working on these IPRs could have preempted the negative outcome by having more information on the patent examiner? Whether you are going through an IPR or filing a patent, the above information could help your position by having a better idea of what an examiner needs to give you, your client, or your company a favorable outcome. Whether you work at a firm or in-house, these are points you should keep in mind. Access to this type of information has an up-front cost, but in the long run, it is an investment. The benefits of additional information could make a difference between an A and a C for a law student, or between a patentable or unpatentable claim.